A House committee on Thursday approved a measure that would require a two-year “cooling-off period” that any political appointee must endure before taking a career job. The Political Appointee Burrowing Prevention Act (H.R. 1132) would also codify existing rules from the Office of Personnel Management that require the agency to sign off when any political appointee in government seeks conversion into a career position. While Democrats on the House Oversight and Government Reform committee voiced concerns with the bill during a markup, they did not lodge any formal objections. 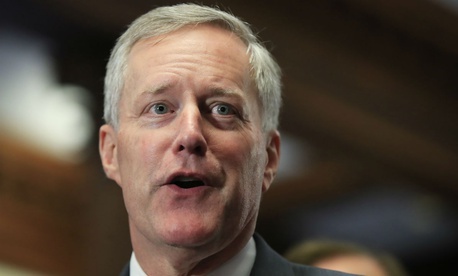 The measure would ensure agencies circumventing the OPM review process are “in violation of a statute” rather than a regulation, said Rep. Mark Meadows, R-N.C., who was filling in as committee chairman during the vote. Agencies converted seven employees without approval between 2010 and early 2016, according to a recent audit by the Government Accountability Office, but OPM conducted post-appointment reviews for the cases in which those workers were still on the rolls. In all of those cases, OPM retroactively denied the conversions. Incidents of political appointees “burrowing in” at their agencies are relatively rare, with OPM approving 78 conversions over the six-year period GAO reviewed. OPM examined 99 conversion requests overall, denying 21 of them. The causes for those denials included bypassing veterans preference, using improper qualification standards, rigging the application process to ensure a targeted appointee was chosen and absence of “critical documentation.” In three cases, the Office of Special Counsel subsequently found agency officials violated civil service laws in requesting the conversion. OSC is still investigating two more cases. The oversight committee also easily approved a measure introduced by House Speaker Paul Ryan, R-Wis., to better measure the efficacy of federal programs. The 2017 Foundations for Evidence-Based Policymaking Act (H.R. 4174) is based on recommendations from the Commission on Evidence-Based Policymaking, and would establish chief evaluation officers at federal agencies, create a comprehensive federal data inventory and federal data catalog, and task the Office of Management and Budget with drafting a governmentwide evidence-building plan based on input from agencies. The lawmakers also voted to extend certain whistleblower protections, voting for a bill (H.R. 4043) to eliminate a sunset provision of the whistleblower ombudsman program.